Automating taking flats using automation software. A few years ago I purchased a Alnitak Flat Man L to improved the quality of my flats. One of the things I’ve wanted to do was figure out how to automate at much as possible including the taking of flats in order to improve efficiency and save time. At the time I used CCD Commander for automation and now use CCD Autopilot 5. They did a good job taking dusk or dawn sky flats but sometimes the sky doesn’t cooperate. Using the light panel is, I think, a much more consistent way of getting high quality flats. Included with the software to run the light panel is a command line program. Its possible to remotely control the Flat Man panel using the command set included with the software. Further documentation is in the help file for the specific commands. The command program is loaded in the Alnitak Astrosystems directory and is called AACMD.exe. AACMD is a simple command line program that talks to the Flat Man through the USB cable. By specifying a series of commands its possible to turn the Flat Man on, set the brightness of the panel and turn the Flat Man off by using the command line program. 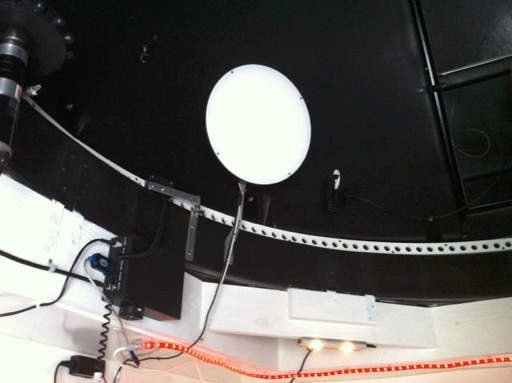 So, to get started, I mounted my Flat Man L in my dome using brackets I had left over from the construction of the Observatory. The panel is mounted in such a way that it is tilted and perpendicular to any scope I would have on my mount. The mounting was such that the panel is in a section of the sky and low enough that I would never image in that region due to trees or elevation. It also has to be high enough that the elevation to the object is positive (+20 in my case) in order for my mount to point at it. Next, I needed to figure out the exact Azimuth and Elevation angle to the panel. I slewed my scope so that it was pointing exactly at the panel and used Maxim to get the Az and Alt. Once I had these values I created a script in CCD Commander that would reference AACMD.exe to turn on the Panel, set its brightness and slew the scope to the correct Alt/Az so that the scope was centered on the panel. CCD Commander then does its automatic flat routine in which it adjusts the exposure times to user selected ADU values and takes the set or series of flats based on filters selected. Once the flats are taken, CCD Commander tells the Flatman to turn off and the scope parks itself. The small CCDC script can be included within a larger imaging script to take flat frames at any time with a observing session automatically. Other automation software like CCD Autopilot or ACP should be able to do this same function.